“We are very concerned, deeply concerned,” claimed spokesman Mark Toner, “that Turkey conducted air strikes earlier today in northern Syria as well as northern Iraq without proper coordination with the United States or the broader global coalition to defeat IS.” Toner also explained that such strikes “were not approved by the coalition and led to the unfortunate loss of life of our partner forces in the fight against” Islamic State. Turkish President Recep Tayyip Erdoğan is very much on top of the world – his world, at least. On the home front, he continues a savage campaign against alleged coup plotters through mass detentions. He is beaming from the referendum results held this month that granted him new constitutional powers. Refuting the suggestion that this latest round of belligerence was an act of introspective, isolated adventurism, he explained that, “We shared this with the US and Russia and we are sharing it with Iraq as well. It is an operation that (Iraqi Kurdistan President Massoud) Barzani has been informed about.” Such an interpretation stretches the meaning of sharing, to say the least. The PKK presence in Sinjar was yet another consequence of violence and its bitter fruit, a response to the murderous efforts of Islamic State militants against the local Yazidi population that saw genocide and enslavement practiced against thousands. Erdoğan is less sentimental about the reaction to IS exploits, concerned that the PKK presence risks creating a “new Qandil” reminiscent of the organisation’s base bordering Turkey, Iraq and Iran. The bloody melange looks all the more complicated for having the US-backed Popular Protection Units (YPG), being targeted by a NATO and US ally, a point that underscores Turkey’s ambivalent role in fighting various fundamentalist groups in the conflict. Turkey is keeping its enemies traditional. The YPG was in little doubt what the actions had done, expressing its anger in a Twitter post. 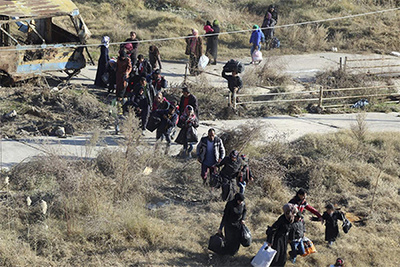 “By this attack, Turkey is trying to undermine [the] Raqqa operation, give (IS) time to reorganize and put in danger live of thousands of” displaced persons. For some months now, Ankara has been insisting that Washington adopt a different approach to their YPG allies, one of studied disentanglement from the Kurdish temptation. Preference, at least from the Turkish side of things, is given to closer cooperation with Syrian units, notably in efforts to remove Islamic State forces from Raqqa. An even more stern tone has been directed at Baghdad, accused of dragging its feet on the issue of dealing with the Kurdish problem. A statement by spokesman Saad al-Hadithi ventured a condemnation, claiming that the raids were “a violation of international law and of Iraqi sovereignty.” Much of this will fall on deaf ears, given the porous, contingent nature of the current Iraqi and Syrian borders. Large powers trample and stomp, and the governments in question seem mere caretakers for the next hostile engagement. Accordingly, the “PKK must stop destabilising and escalating tensions in the area to allow life to return to the people of the area.” A frightful mess and one that Erdoğan has every intention of complicating.